Probably the best way to deploy photovoltaic cells around the world and in our everyday life, would be to make them see through. This new generation of windows, could replace every window in the world everywhere, and become an unimaginable new source of energy to every home and office. But until recently, this has been more a dream then reality. However, last month this has changed. Although the SolarWindow has been in development for a number of years, only recently has it achieved the size of a small window. Today, the SolarWindow can encompass an area of 170 square centimeters, which is more than 14 times larger than the previous version of the OPV module. The manufacture of a SolarWindow consists of spraying liquid-form polymers onto a substrate. Last month, scientists were able to use a high-speed/large-area solution-coating process, which allowed for a more rapid scale up to bigger glass surface areas. 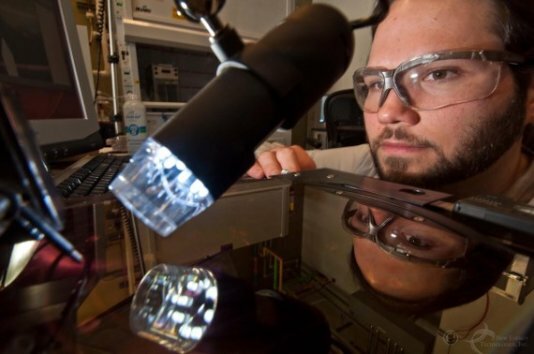 Unlike conventional solar technology, which relies on silicon-based photovoltaic cells, OPV technologies use organically synthesized polymers, which are also cheaper to manufacture. There is no word yet on pricing, energy generating capabilities, or a a timeline for manufacturing, but it looks like New Energy Technologies shares, can become a green, do good lucrative investment for the future.